January has come and gone, and my first month of blogging, drinking, and judging has been interesting in so many ways, filled with surprises, delights, and — yes — 18 different Starbucks in 14 different neighborhoods. One of the first surprises was the fact that people had actually started reading my blog — then going one step further: writing about it. The fact that what I was doing was arousing people to either criticize or praise it (and yes, there has been a good amount of criticism) was highly intimidating at first. But after a month, I’ve learned to welcome the criticism (and the praise, duh!) and attempt to use it to improve both the quality of my writing and the appearance of the blog. Often times, I feel that writing about the Starbucks here in New York has pinched an NYC-nerve. I’ve come to realize a lot of New Yorkers see Starbucks as an invasion and a representation of the withering authenticity of the city. But the fact remains, there’s still 201 of them on this tiny island we call Manhattan, and I can’t go 10 seconds on the street without spotting someone adorning that o’so familiar green and white cup. 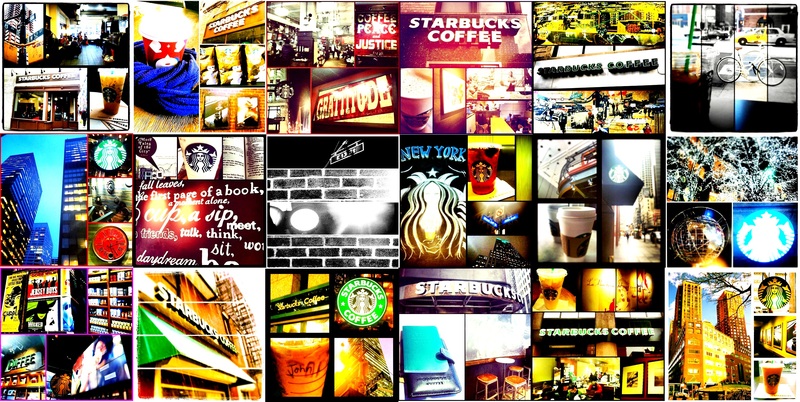 So like it or not, Starbucks has melded into part of this city’s identity, and this blog is my attempt to learn more about it. As for the delights — I’ve been delighted by the support I’ve received by friends, family, strangers, and Starbucks itself — and no, I’m not talking about financial support. Although I did receive a $50 Starbucks Gift Card from a fan of the blog (thank you!) — believe it or not — I don’t work for Starbucks nor am I doing this in any attempt to market for them. The support I appreciate most comes verbally or in writing. The positive affirmations I’ve received from complete strangers and close friends alike have encouraged me to see this thing through to its end. Yes, I may be that crazy guy that wants to go to all the Starbucks and blog meaningfully about it, but that’s a reputation I’d be delighted to accept. And as for the 18 Starbucks I’ve visited, my experiences have varied so greatly. I’m proud that I was able to go to as many as I did and also that I was able to see 18 very-different locations that spanned from 1-Cup to 5-Cup in rating. Going forward, I will attempt to visit some new neighborhoods and to try some new drinks. I’ve noticed I have the tendency to fall into a rut of plain hot coffee, and I want to try to explore the menu and my tastes a bit further. Although it’s only been a month, I can already feel myself learning and growing as a discover more and more about this larger than life city, stuffed with millions of people, countless things to try — and yes, a whole bunch of Starbucks. Well, despite all the criticisms, I’m liking what I’m seeing – keep up the good work, and congrats on your first month of blogging! Great blog. It’s been very helpful. I now know where to stop for my coffee. Please keep writing.